Ska heroes The Specials on stage in 1981. 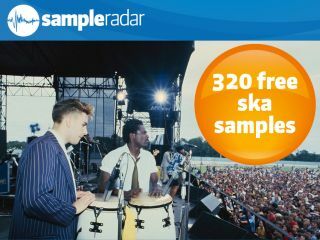 MusicRadar has already given ska the A-Z treatment, so rather than attempt to sum up the genre in a couple of lines, give that a whirl and you'll get a comprehensive 26-step guide. Right here, though, we're exclusively about the royalty-free samples: dive in and download. The samples are supplied in a massive 130bpm construction kit. In here you'll find Major, Minor and Percussion folders, which contain bass, brass, organ, sax, trombone, trumpet and drum loops. The ska samples are supplied in a zip file, so you'll need to extract them before you can see them. Enjoy!